Why does a retina display matter? Have we reached the pinnacle of high-resolution displays with the new iPad? The new iPad's screen is so good, Apple's had to invent a new word for it: 'resolutionary'. The display is the sharpest screen you'll find in any tablet, and it's a technical marvel: Apple has pushed display technology to its very limits, delivering something that looks like it's been beamed in from the future. But is there any substance to the style? Will the Retina display mean better, brighter apps, or will our iPads struggle as apps become bigger and more bloated? Let's find out. When Apple talks about a Retina display it's not referring to a worldwide standard or a set of specifications. It's actually just a marketing term, and it simply means that the screen has sufficient pixel density, so that when you look at it normally, you can't make out all the individual pixels. The key word here is 'normally', because that differs from device to device. The new iPad's screen doesn't have as many pixels per inch as the iPhone 4S, but it's still a Retina display. The difference? Distance. Apple reckons that the normal viewing distance for a mobile phone is around 10-inches, but for an iPad the distance is 15-inches. To deliver a Retina display at 10-inches you need to pack in more than 300 pixels per inch, but at 15-inches you can get an identical effect with considerably fewer pixels. The iPhone 4S has 326 pixels per inch, and the new iPad delivers the same quality with 264. At least that's what Apple would like you to think. But is it actually true? We think it is: in everyday use, the new iPad's screen is as crisp and as clear as our iPhone 4's, with no noticeable jaggies - or at least, none in apps that have been updated to take advantage of the new iPad's extra pixels. The resolution is twice that of the iPad 2: it's running 2048x1536, and the iPad 2 runs 1024x768. That means the iPad has more pixels than a 1080p high-definition television, which maxes out at 1920x1080. The new iPad's display is miles better than not just today's rival tablets, but tomorrow's: current Android tablets typically run 1280x800 displays, and the forthcoming full-HD tablets from the likes of Lenovo and Asus run at the same resolution as HD TVs, 1920x1080. Full HD in a tablet is pretty impressive, but at 224 pixels per inch it's still a considerable way behind the iPad - and the iPad is shipping now, not at some unspecified point in the future. The display isn't just better in terms of pixels. According to Dr Raymond Soneira, president of display calibration experts DisplayMate Technologies, the new display has better colour saturation too: "a virtually perfect 99% of the Standard Colour Gamut… [colours] are 'more vibrant' but not excessively so or gaudy like some existing OLED displays." The new iPad is "most likely better and more accurate than any display you own, unless it's a calibrated professional display. In fact, with some minor calibration tweaks the new iPad would qualify as a studio reference monitor." On paper, then, the new iPad has the best display around. Does it matter? Many tech specs don't matter much: on paper the iPad is often trounced by rival devices with more horsepower, more memory or an extra bit to plug things into, and yet we all know it's the best tablet money can buy. Is the Retina display a real step forward, or does it just give Apple a few numbers to annoy the competition with? We think it's the former. 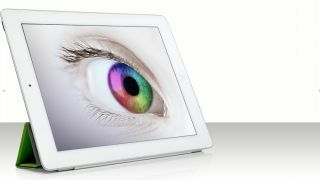 The Retina display is the latest step in Apple's plan to make technology disappear. The first step was iOS and multi-touch: as endless YouTube clips of iPhone and iPad-using babies demonstrate, you no longer need to learn computing to use a computer. The next step is to make the computer itself disappear, and the retina display does that. Take magazine apps, for example. On non-Retina displays even the most beautiful magazine app is still a bit computer-y: the screen can't deliver text that's as sharp as printed text, or images as sharp as printed ones. A Retina display can. You're no longer reading a magazine on a screen; you're simply reading a magazine. It's more effective than on the iPhone, too, because the bigger screen means you're not scrolling every four words. Email and ebooks are easier to read, app interfaces look more realistic, photos are brighter and sharper and Flipboard feels like it's been sent from the future. When you think about it, it's really quite extraordinary. It's also extraordinarily difficult to make. 264 pixels per inch is pushing the limits of current TFT display technology. However, Samsung (who make the iPad screen) have recently announced a 5-inch screen with a full 1080p resolution. This weighs in at a mighty 440 pixels per inch but isn't currently available in any products. Achieving retina resolutions with current TFT technology isn't easy. The more tightly you pack the pixels, the lower the display's aperture ratio becomes. The aperture ratio is the ratio between the pixel's transparent area and the whole pixel area including wiring; the smaller the ratio, the less light gets through. To compensate for this, Apple has been forced to double the number of LEDs in the iPad's backlight, which uses 72 LEDs and requires two and a half times more power than the backlight in the iPad 2. The other issue with Retina displays is that the more tightly you pack the pixels, the more likely you are to encounter unwanted capacitive coupling, which is when signals jump from one component to another and cause interference and image artefacts. To address this Apple has used Super High Aperture (SHA) technology, which places a layer of resin between the pixels and signal lines to keep everything in its right place. By area, every iPad is made primarily of battery - and the new iPad has the biggest one yet, which is why it's slightly thicker and heavier than its predecessor. Driving those extra LEDs requires lots of power, and to achieve the same battery life as an iPad 2 the new iPad's battery has been upped from 25 watt-hours to 42.5. The new screen isn't the only culprit - 4G mobile broadband radios, which are available in the new iPad, are infamous battery hogs too - but there's no doubt that Retina displays are more power hungry than non-Retina ones. The quad-core graphics in the A5X processor and the RAM increase from 512MB to 1GB are largely to drive the display too: without them, the new iPad's performance wouldn't be anywhere near as impressive. Retina apps can be hungry as well, not for power but for storage space. Retina-friendly versions of apps can be significantly larger than non-Retina ones: Pages went from 95MB to 269MB, Numbers from 109MB to 283MB and iMovie from 70MB to 404MB. The difference isn't just higher resolution textures, icons and media, but there is a real danger that for graphically rich apps, Retina-friendly content could quickly overwhelm even the roomiest new iPad. The problem is particularly annoying when an app uses pictures, such as JPEG images, to render text. Not only is that bad for accessibility - VoiceOver can't read it out, it can't be copied and so on - but it's bad for app size: the new iPad has four times the pixels of the iPad 2, and that means images need to be four times larger to look good. That could be disastrous for apps such as some digital magazines, whose creators export the whole publication as a series of images. As Christopher Phin, editor of our Retina-friendly and distinctly un-bloated sister title Tap! explains, "If you're rasterising text to pixels rather than just letting it be text, your issues are going to bloat even more once you adopt Retina. If your issue is 650MB now, an issue built for Retina display could be 2.5GB." As Chris notes, apps will contain the graphics for both Retina and non-Retina displays, so that 650MB app could easily go past 3GB. Tap! doesn't use images to display text, and we sincerely hope other publications follow its lead. Otherwise there are going to be a lot of unhappy iPad owners out there. Even if you don't subscribe to digital magazines, the Retina display could cause you some storage problems: videos and photos that have been optimised for previous iPads running 1024x768 resolutions don't look so good on the new iPad, and that means you'll have to decide whether upping the quality is worth sacrificing space for. If you think you'll be watching a lot of HD video or storing lots of high-resolution photographs, you might regret buying a new iPad with just 16GB of storage space. It'll be interesting to see whether badly designed Retina-friendly apps also cause problems for older iPad users. We hope not. The Retina display is the best screen you'll find on any device, and the difference it makes is dramatic. It's like upgrading from dot matrix printers to laser ones, or from VHS to DVD. Once you've seen it, you'll want it - so if you're happy with your existing iPad, you should probably steer clear of the Apple Store. Check out how the new iPad 3 display got on when it went head-to-head with the Asus Transformer Pad Infinity in our video below.